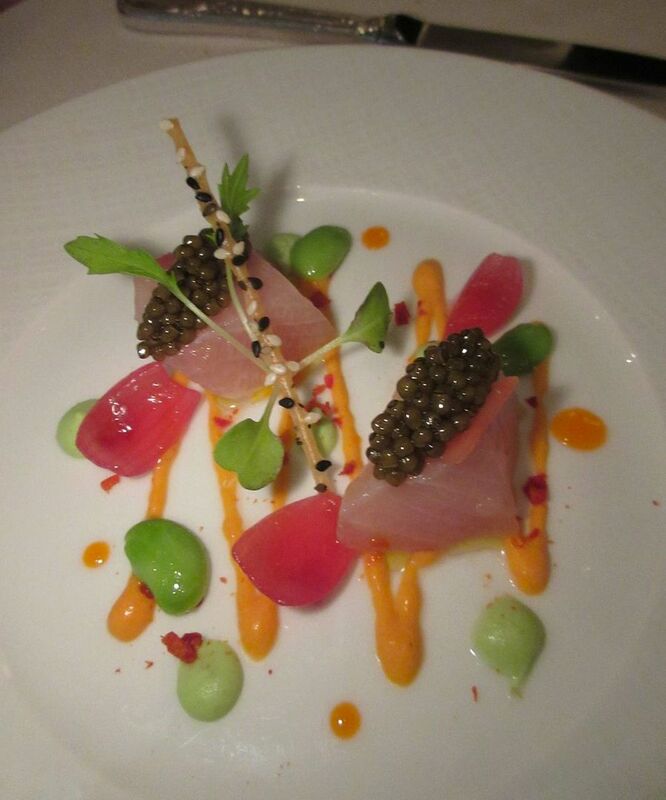 A great after-movie supper for two at Boulud Sud. An eating binge with “friends and family” at Shelly Fireman’s transplanted Bond 45. 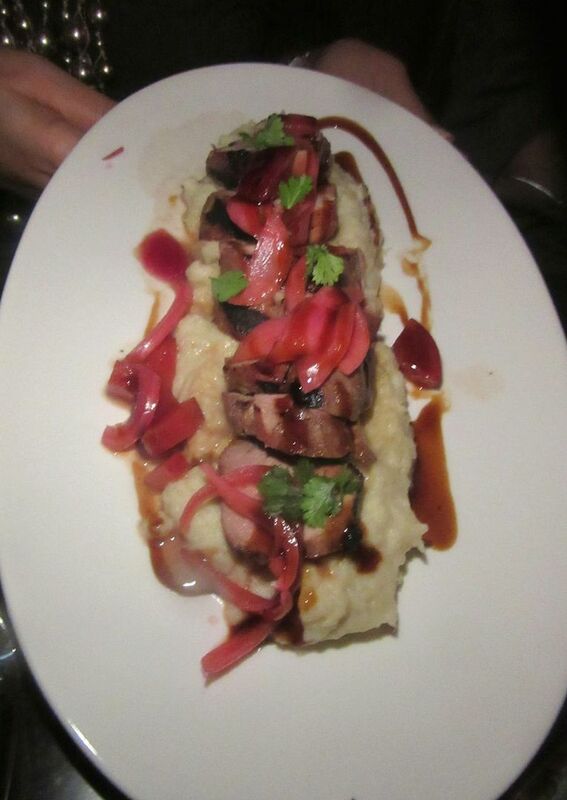 Cuban-Chinese adventure at the new Calle Dão Chelsea on far West 23rd Street. It looks like I’ve been eating around on the West Side these recent evenings…determined to avoid the traffic plague. 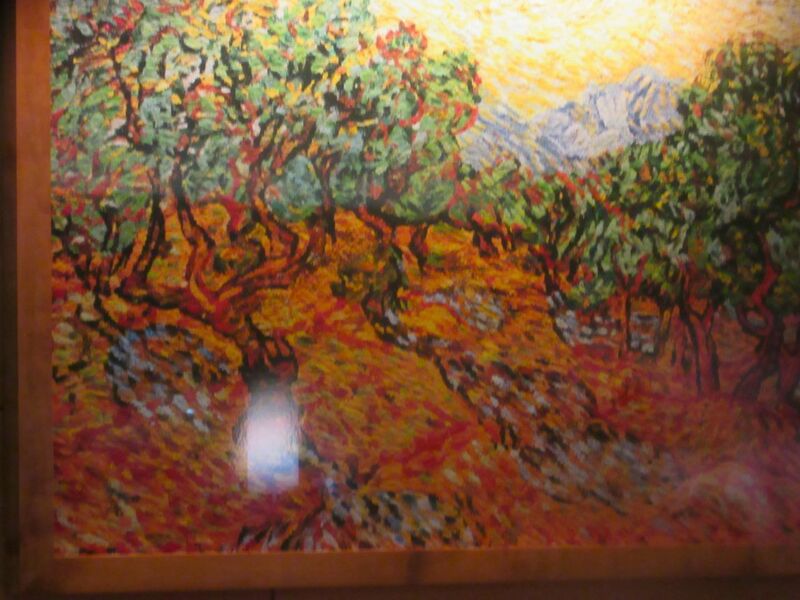 Boulud Sud is a smart-looking place and from a table in the rear, I admire the intimations of Van Gogh. Exhilarated by powerful images of Liam Neeson and Diane Lane at the screening of Mark Felt: The Man Who Brought Down the White House, and hungry too, my niece Dana and I walk quickly downtown from AMC 68th Street to a two-top against the window near the rear at Boulud Sud. 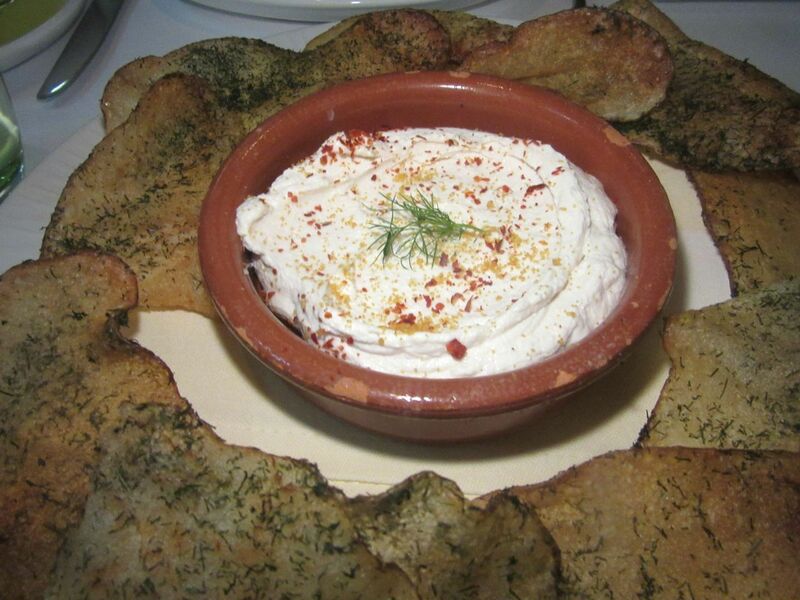 The taramasalata is served separately, surrounded with housemade chips rubbed with spices and herbs. 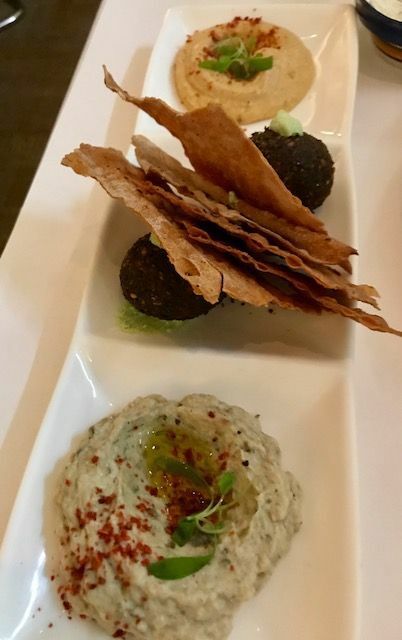 We order our usual – Mediterranean mezze with crisps and focaccia, and taramasalata surrounded by big ovals of housemade chips. The spreads and even the chips taste better than usual tonight. I can’t say why. Sprinkles of spice and herbs, maybe? Afterward, soup seems soothing. But neither of us can quite polish off very generous servings in pretty pottery bowls. 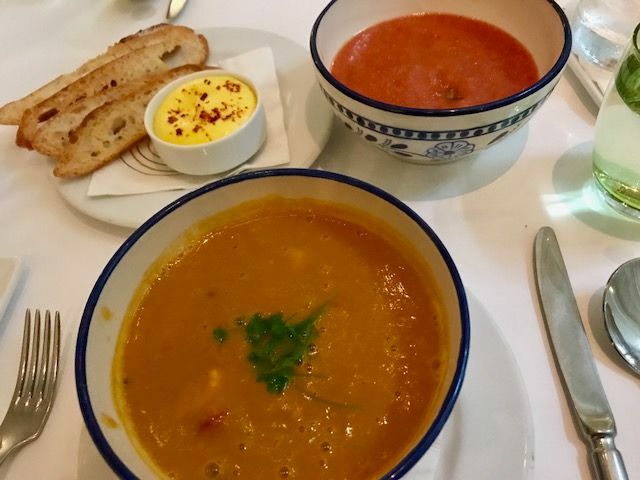 Saffroned seafood soup with clusters of shrimp, fish, and potato at the bottom for her, and for me the tomato-watermelon gazpacho, so perfect on this unseasonal hot and humid night. 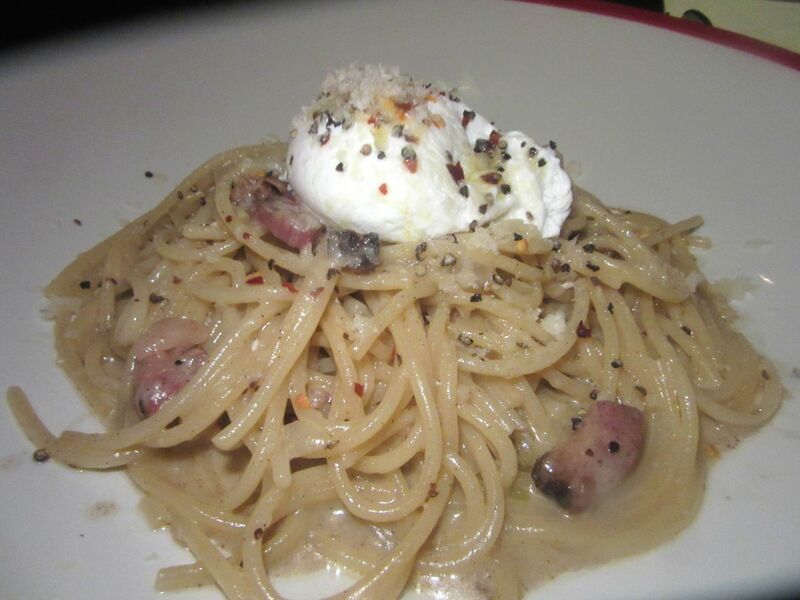 On another evening at Boulud Sud, I might order the fettucine carbonara, enough for two to share. Executive chef Travis Swikard comes out to say hello. He was here as sous chef when Boulud Sud opened but he does revise the menu and seasoning can change depending on a line cook’s tastebuds. For some reason, neither of us has had a drink, so the tab with tip is a gentle $74. 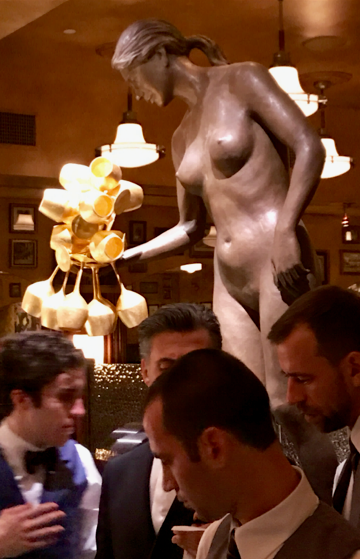 Boulud Sud, 20 West 64th Street between Broadway and Columbus Avenue. 212 595 1313. Lunch Monday through Friday 11:30 am to 2:30 pm. Dinner Monday through Saturday 5 pm to 11 pm. Sunday 5 pm to 10 pm. Brunch Saturday and Sunday 11 am to 3 pm. The weekend before Bond 45 opens its doors on the west side of Times Square, “friends and family” take turns filling its leather-lined booths, trading various menus that, with typical Shelly Fireman ebullience, offer full portions of almost everything that might end up on the new menu. It’s the prix fixe that costs nothing. The three of us are into it. 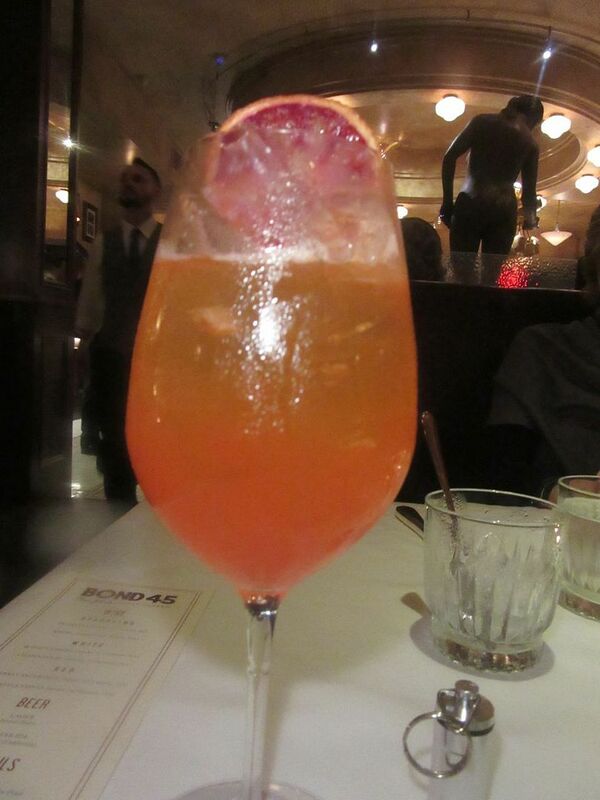 I let my spritz last all evening at Bond 45’s friends and family dinner just before it opened on 46th Street. Gabriele Guidoni, the dashing beverage director we first met at Florian, comes by to explain why his spritzer is better than anyone’s. “I use a splash of passion fruit puree,” he confides. The blushing drink comes in a tall goblet. Walk in to the new Bond 45 and confront the antipasto display. Photo by Dana Stoddard. “You mean we can each order whatever we want…three courses, one from this menu, two from the other menu?” we ask. Yes. Yes. Yes. Tonight Fireman is the Molly Bloom of West 46th Street. I’m sipping my spritzer slowly. 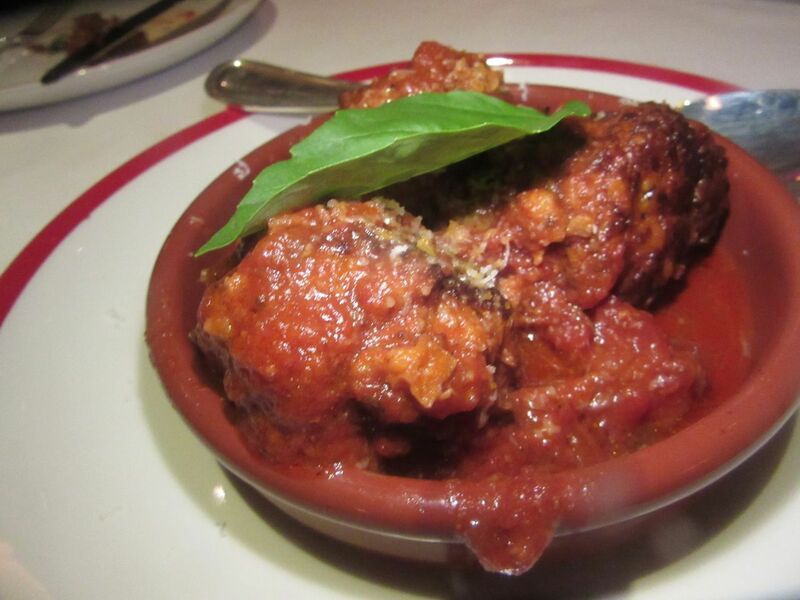 Nonna’s shortrib meatballs are fatty and rich. That’s short rib for you. 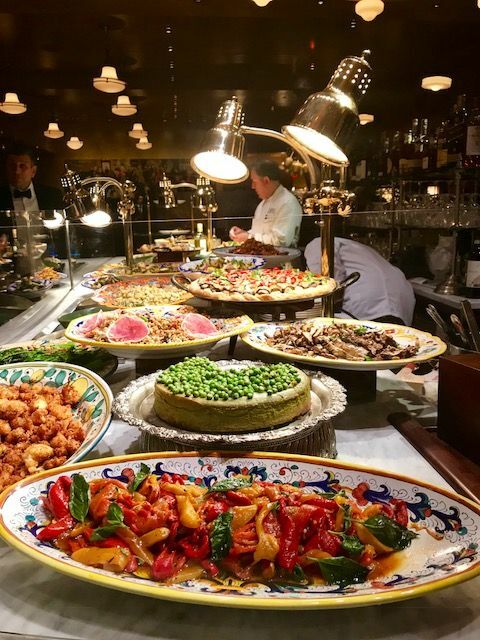 It punctuates the “simply vegan” ribollita soup, Nonna’s rich and fatty short rib meatballs, and the fried calamari with slivers of vinegar peppers. Surely we want the chicken wings Calabrese with fennel, lemon, and Gorgonzola. 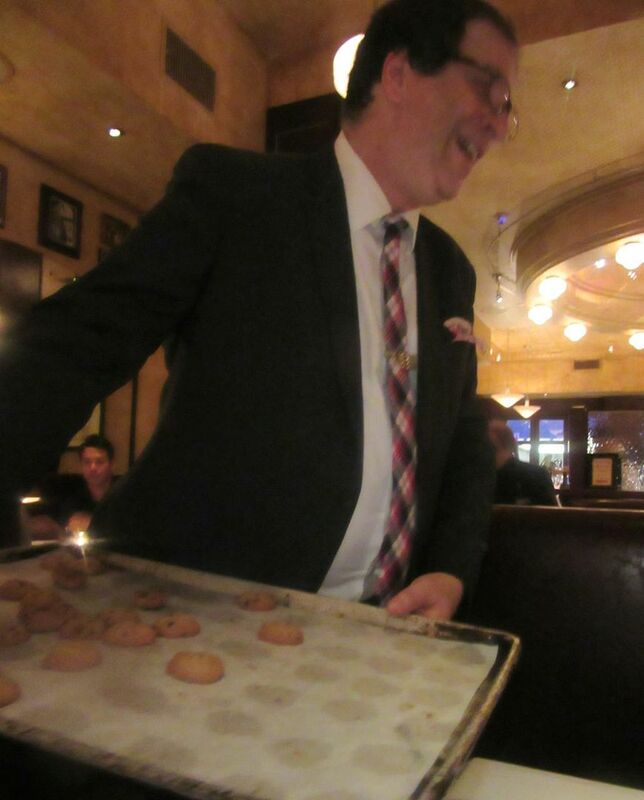 A manager passing with chocolate chip cookies just out of the oven is a tradition in Fireman restaurants. A manager passes with fresh chocolate chip cookies, just out of the oven, a Fireman tradition. I take two for later. 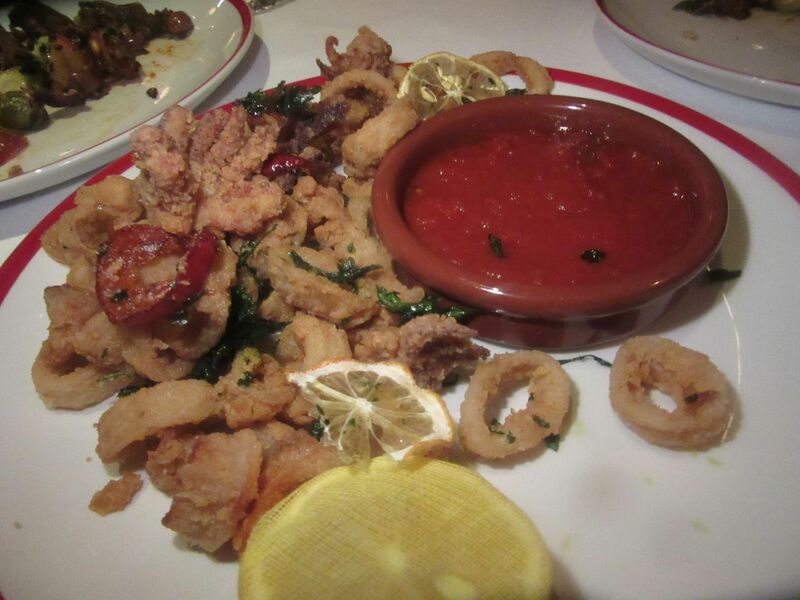 Bond 45’s fried calamari are studded with hot vinegar peppers and served with a dipping aioli. We discuss asking for the “gooey Margherita pizza with triple burrata.” As a regular at Café Fiorello uptown, I notice Fireman has been bitten by the burrata blight. 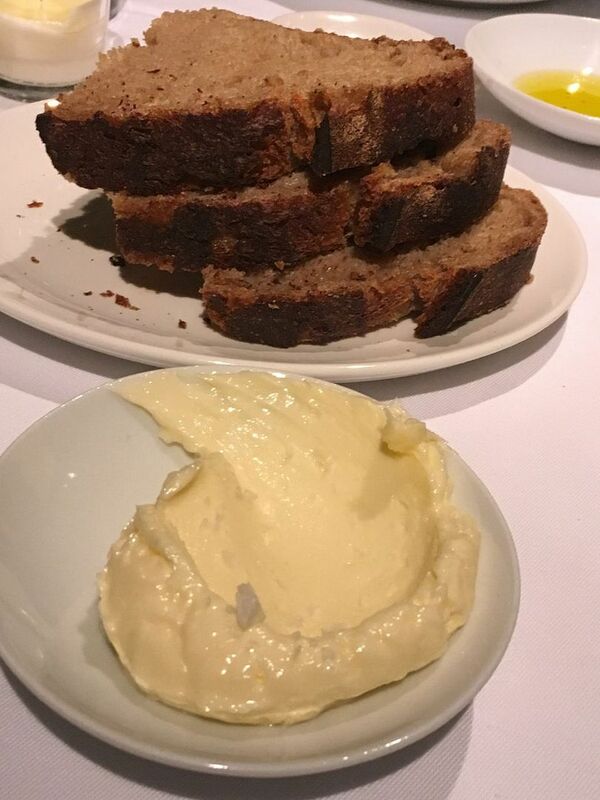 One dab of buttery burrata is not enough. Double burrata won’t quite do it either. It must be triple. And it’s everywhere, even on this historically simple pie. 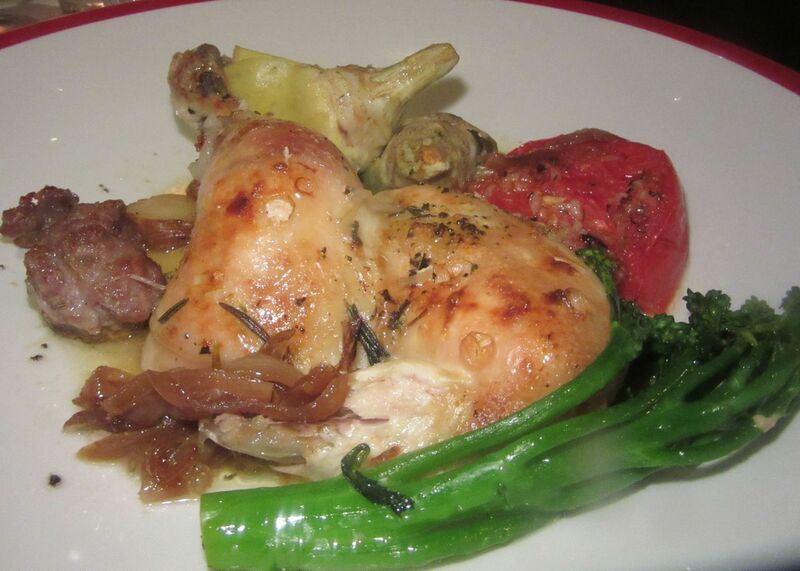 The roasted chicken comes with artichokes, sausage, broccolini, heirloom potatoes and roasted tomato. 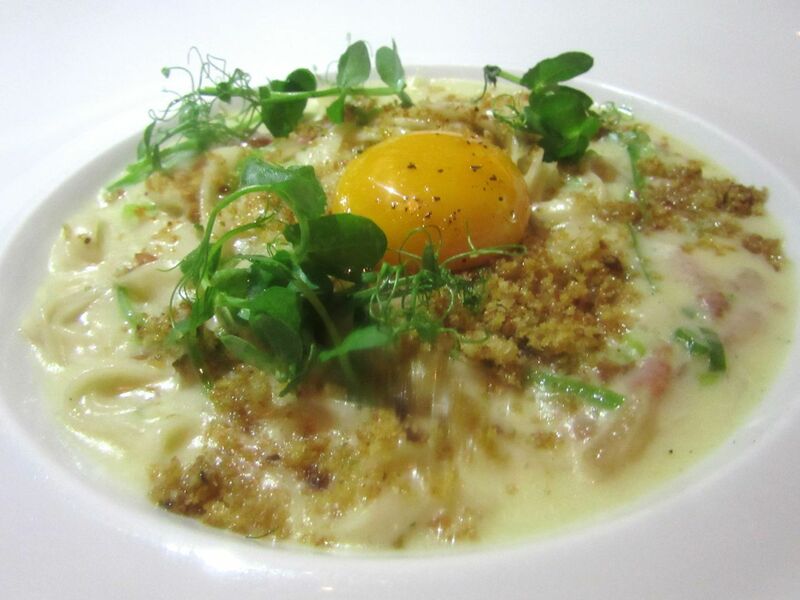 I did admit I’m a carbonara fan. Here’s a version with pastrami bits at the new Bond 45. 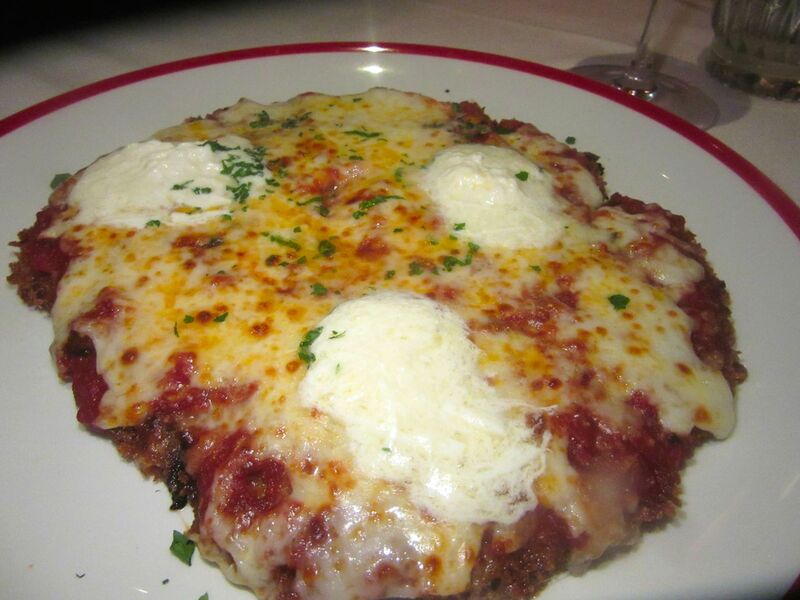 Chicken pepperoni parmigiana is topped with melting burrata and guanciale breadcrumbs. 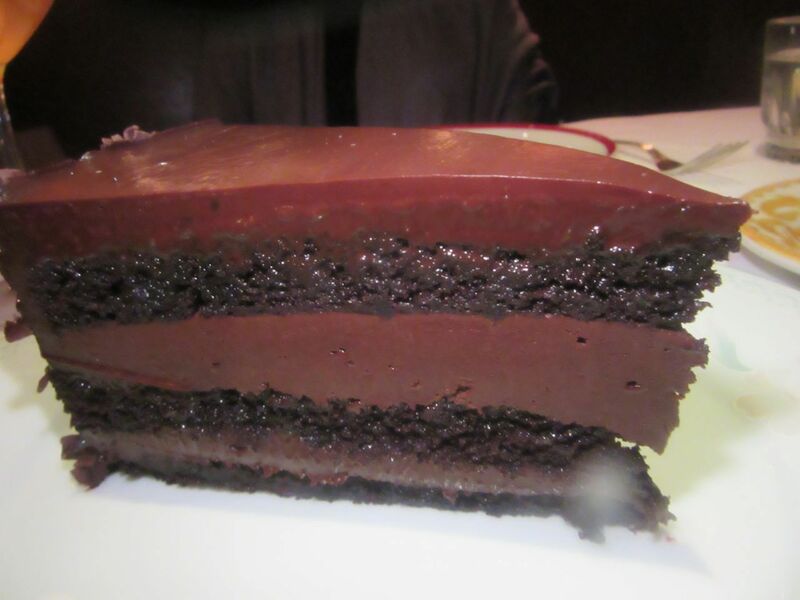 None of us thought dessert was possible after tasting so much till the blackout chocolate cake appeared. I was remembering great char sui pork at a Rainbow Room brunch, but this meat was sadly dry. Dave Pasternak’s Barchetta, Amy Sacco’s Bette, Alain Allegretti’s La Promenade des Anglais. His revamped Bistro de Promenade. This space in London Terrace Towers has seen a parade of restaurants with grand hopes arrive only to fade away. 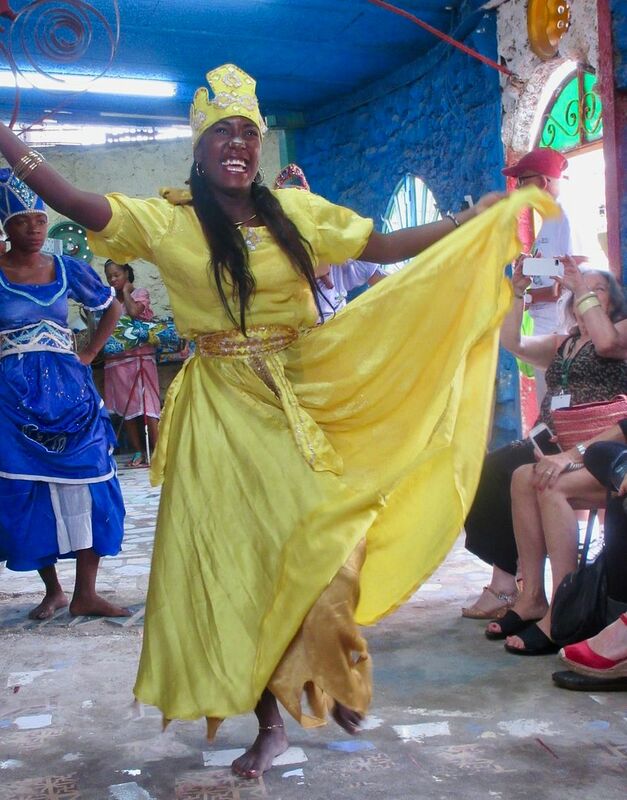 Can Calle Dão Chelsea, a celebration of Cuban-Chinese cooking, beat the curse? Swirls of black iron gates, potted palm, cigar boxe and Chinese cigarette posters add charm to the room. 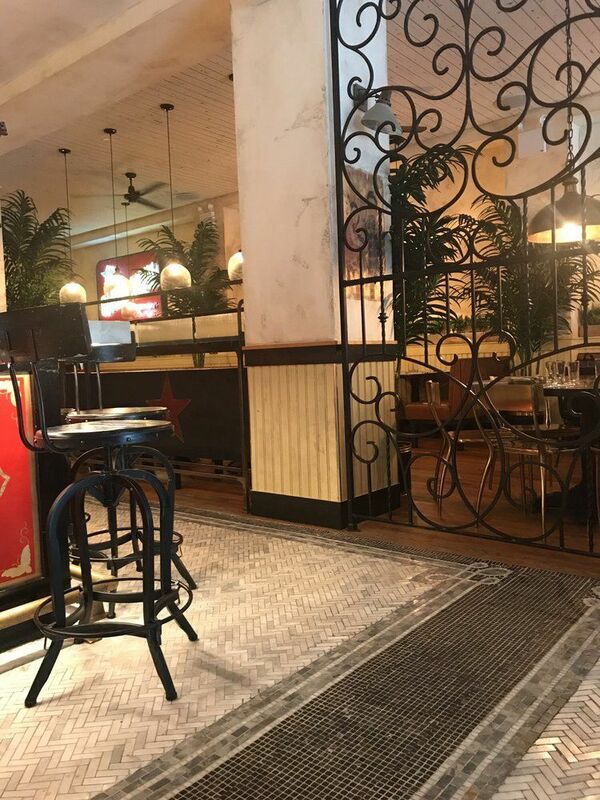 It’s pretty enough, with swirls of wrought iron gates and palms, the cigar boxes over the bar, and the smell of tobacco leaves at the greeting stand. But some staff discipline is definitely needed. The drink order is taken, and then one by one another four men stop by and ask what we'd like to drink. “Do you think my whiskey and water order is why our drinks are taking so long to come?” one of my friends complains to what seems a figure of authority. “You are just one of 14 tables waiting for drinks,” he replies with annoyance. “Everyone arrived at the same time.” That’s not a tone aimed at longevity. But we’ll see. 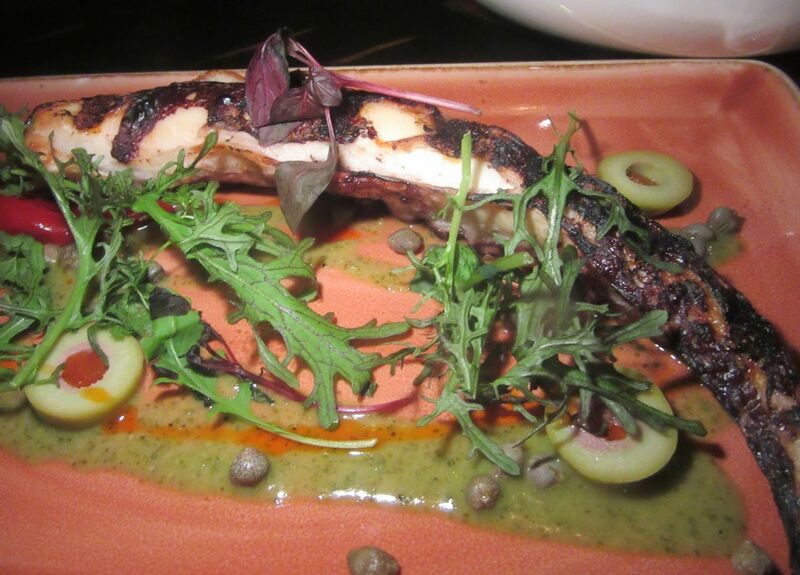 Chef Bradley Warner serves charred octopus with chorizo oil, capers, pimenton and olives. The charred octopus with chorizo oil, capers, pimenton, and olives, and a savory toss of greens with Asian pear, beech mushrooms, edamame, and toasted almonds, arrive seconds before cocktails. My margarita-like Barrio Chino, with tequila, apricot liqueur, and tea syrup is a hit. 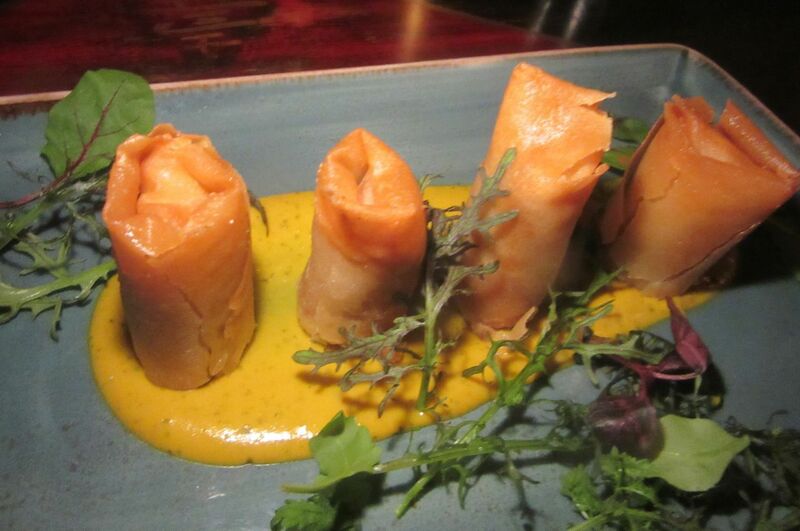 Small Cuban sandwich spring rolls sit on Mojo lime mustard. 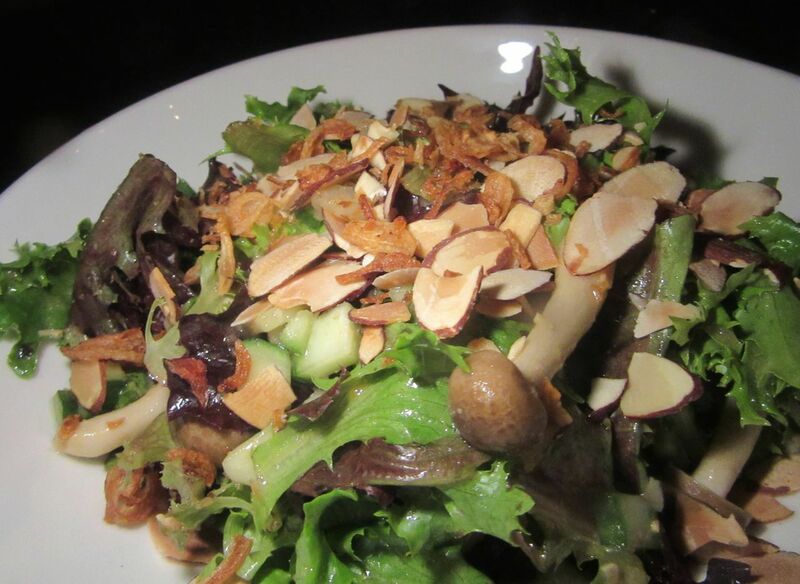 A dieting pals said she would just eat the greens tossed with Asian pear, mushroom and toasted almonds. Crisp Cuban-sandwich spring rolls to drag through mojo lime mustard, and the oxtail croquetas with mango chutney and saffron aioli, are excellent, expertly done, and quickly disappear. Hard to believe the primitive pan-fried short rib dumplings emerges from the same kitchen. 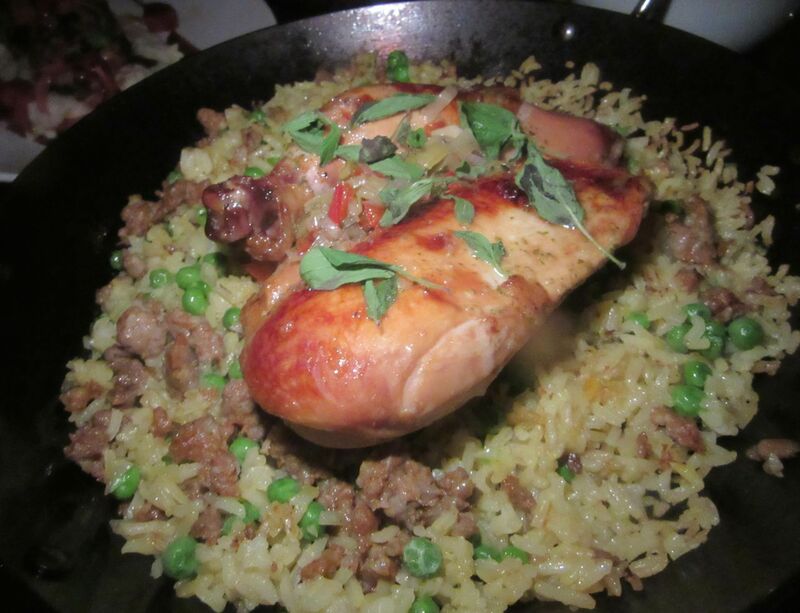 Even though the Peking chicken isn’t very Pekingish, it’s juicy and delicious on yellow rice with chorizo bits. I want to try the spiced goat neck and the sour orange pulled duck over fried rice, but we finally agree on the 14-hour char sui pork tenderloin on plum onion escabeche, and Peking style roast chicken and yellow rice. Peking style is a slight exaggeration – the bird is not a lacquered shard, though it’s browned, moist and delicious. But the pork is sadly dry. 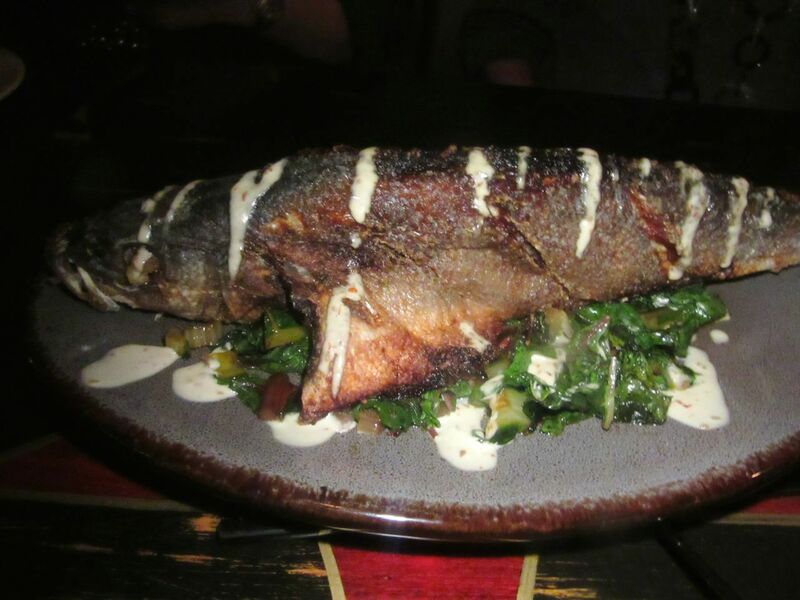 The crisp-fried whole branzino was the winner at our table and also good for the calorie-counter. 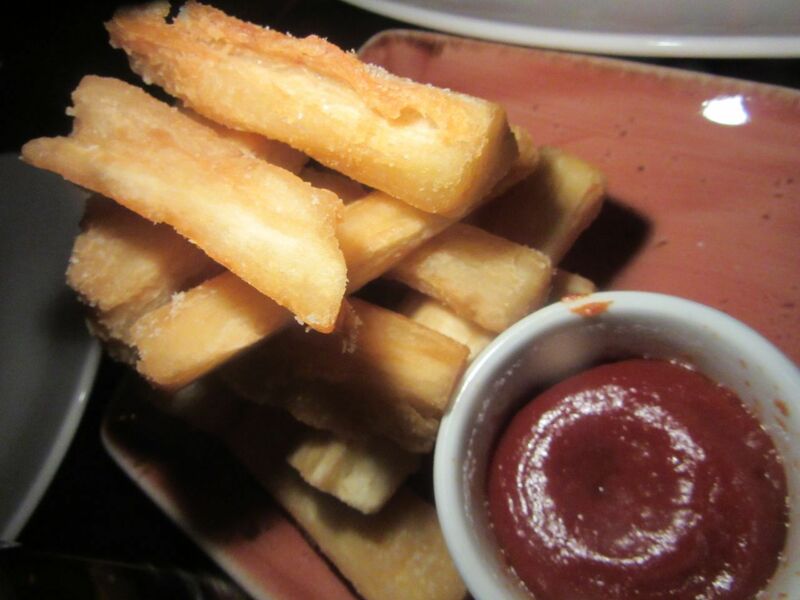 When I see yucca, I order it: here a side of excellent fat fries with gochujang ketchup. The masterly, fried whole branzino served over wok-fired rainbow chard with sesame XO sauce makes up for disappointments. It’s a big beauty, slightly too cooked for me, but just right for everyone else. I notice a large piece of crusty skin with some flesh attached and claim it for myself. 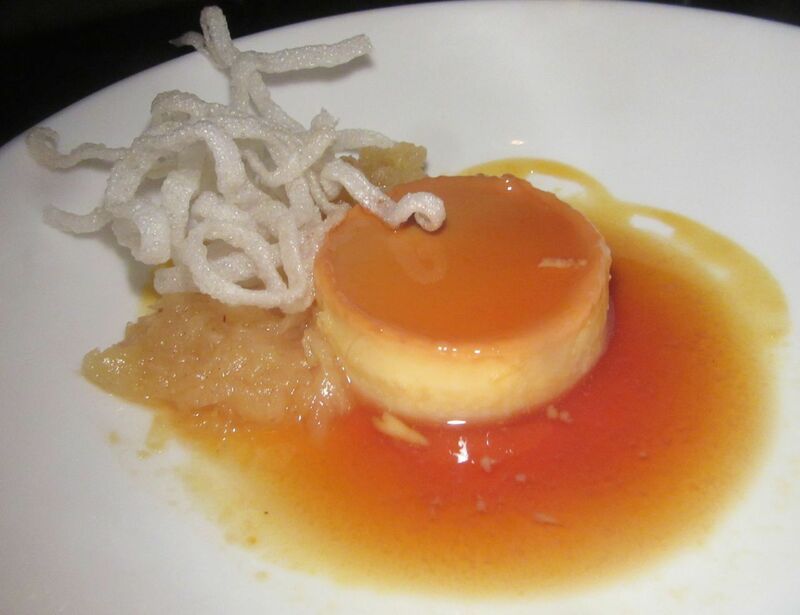 Crispy rice noodles garnish coconut rum flan with pineapple jam and grated passion fruit. 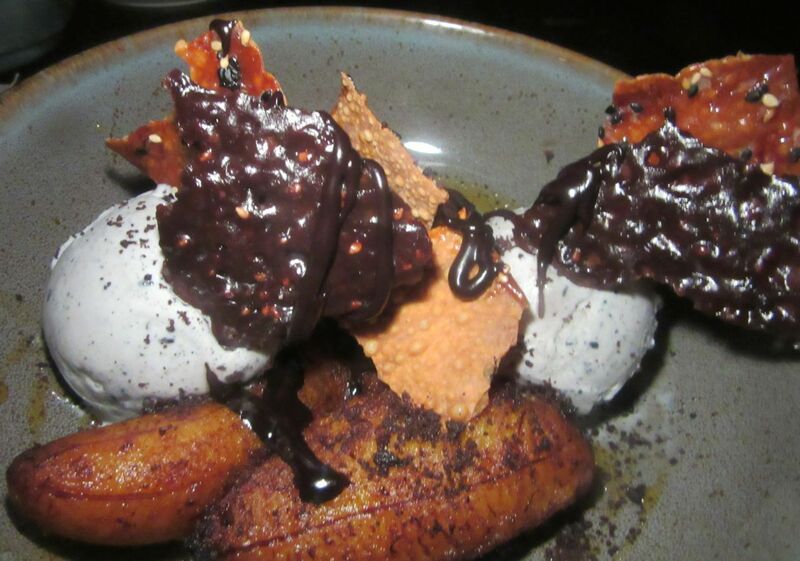 Dessert chef Kate Holowchik has Maduro mimicing a banana split with black sesame gelato and tuile. I can’t remember the flan, but I recall welcoming a taste of sweetness from black sesame gelato in the maduro split. 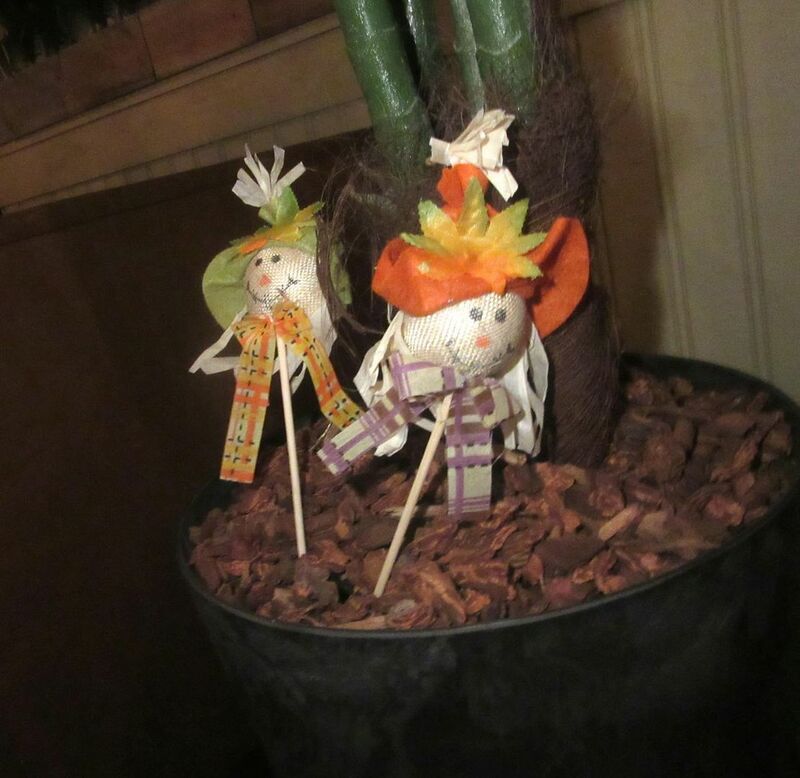 I'm told the scattered small dolls on sticks are little scarecrows planted early for Halloween. 461 West 23rd Street between Ninth and Tenth avenues. 212 414 4104. Sunday through Wednesday 11 am to 11 pm. Thursday through Saturday 11 am to 11:30 pm.